We believe open data has the power to drive decisions, improve delivery of services to citizens, and enhance public outreach and advocacy. We are committed to make our technology available to those who share the same values. Open data has the power to drive decisions, improve delivery of services to citizens, and enhance public outreach and advocacy. Public institutions, nonprofits and media in developing countries are increasingly engaging in efforts to adopt technologies and use open data deliver on their missions. Yet, they often find themselves lacking access to tools, resources, and skills to help them effectively analyze data to improve decision-making and arm the public with digestible information. At Keshif, we have developed a program to fill this digital access and literacy gap. Our program provides contextualized tools, an easily deployable and affordable technology, and skills to support institutions to drive decisions, deliver programs and improve policy. We aim to strengthen the voice of civil society organizations to enhance their advocacy efforts for an informed public. We designed a rapid and iterative learning journey based around the needs of mission driven organizations, and the strengths of our easy-to-use and locally adaptable data visualization and analytics technology. By combining Keshif’s ready-deployable visualizations with hands-on training modules and one-on-one mentorships, we make it easy for the community of practitioners — with or without data background — to learn, adapt, and rapidly develop open data applications for public good. 1. The maximum amount that (data) can contain. 2. The ability or power to do, experience, or understand (data). Participants receive hands-on training on data literacy, management, analysis, visualization and exploration by a team of data scientists and governance practitioners. Participants have full access to Keshif’s online, web-based platform to visualize and explore data quickly and easily with automated visualizations and exploratory interactions. Each participating organization develops a new local data-driven campaign or strengthens an existing one with improved data-driven analysis, presentation and discovery. Each organization has access to one-on-one consultation and mentoring sessions with the Keshif team to discuss their mission-specific goals and needs, generate and test ideas, and develop informing data-driven solutions. We focus on rapidly achieving progress for each organization. To achieve that, we iterate on ideas and outcomes throughout the program. 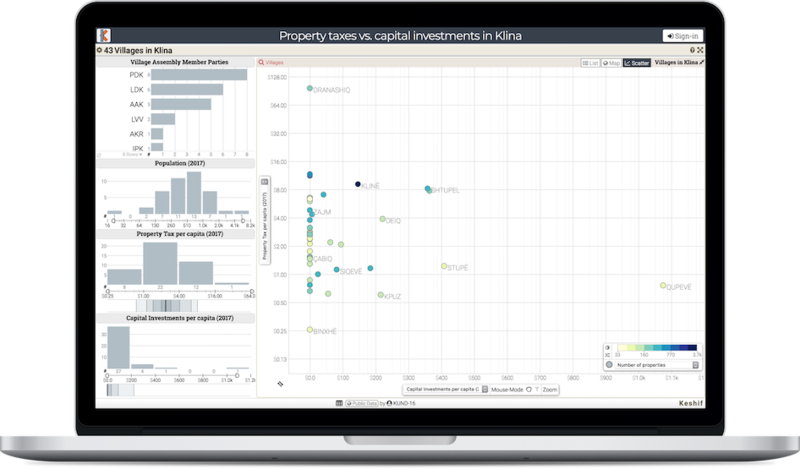 Our flagship product, ​​Keshif, is an intuitive web-based platform built for rapid data visualizations, analytics, and discovery. Keshif is easy to use, and requires no programming skills or data science background to move from raw data into rich exploratory visualizations. The tool enables viewing of trends, outliers, aggregations and individual data records, and highlighting, filtering, comparing, sorting data, and sharing results, all in a few clicks. Explore Your Data at our platform!